Q: My big toe on the right foot is having this weird tingling pain. Does anyone has the same problem? What should I do to address it? A: This is a common problem and the solution for it is surprisingly simple. There is a nerve that runs over the top of the instep of your foot that is in a prefect position to be pinched by the eyelets and shoelaces. 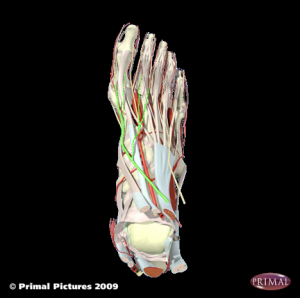 I know that your mind must be racing with excitement to know the name of this nerve and I am equally exuberant to showcase my limited fund of knowledge so here’s a picture of “The superficial Tibial Nerve!” It is highlighted in green on the anatomy picture to the right. The fix for this is simple; re lace your shoes and eliminate the second or third loop, leaving a soft spot on the top of your shoe where the nerve crosses over the bone. Option number 2: get different shoes. I would opt for option 1 since this will probably come up again sometime in the future.